Hawkmoths (or sphinx moths) are large charismatic moths that fly at night. When they fly, they must avoid their primary predator, bats. Research in our lab is focused on understanding how hawkmoths are related, and what they communicate to bats — are they confusing bats by making noise, or do they tell bats that they are inedible? Hawkmoths are frequently attracted to lights at local gas stations and parking lots during the night. 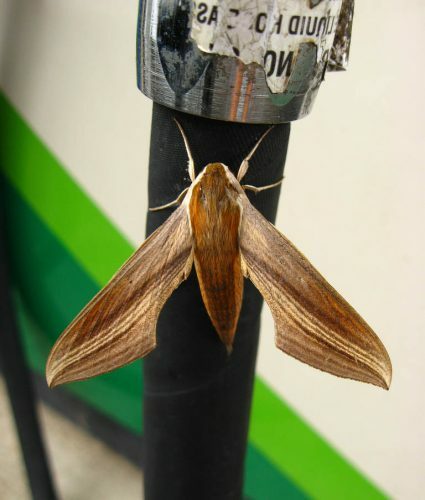 Moths at gas stations are vulnerable to predatory birds and will likely not survive. We plan to use this opportunity to study these moths so that we can obtain eggs and rear adults to test moth-bat communication strategies with the Barber Lab at Boise State University. Data from this project will also be used to generate distribution maps to determine how hawkmoths have changed their range in response to climate change and habitat destruction. Cyclists are an ideal group because they stop at gas stations in the early morning, when hawkmoths from the night before still remain. We hope that cyclists, local residents, students, and children will participate to sample hawkmoths at gas stations, parking lots, and backyard lights to help us answer some of these fundamental questions. If you would like to participate in this project, please read our sampling instructions. Sampling kits are available for free at the McGuire Center for Lepidoptera. 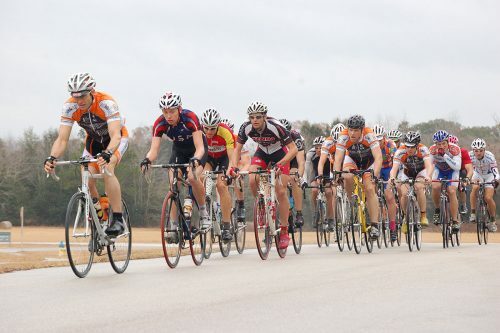 Cyclists, residents, students, and children are all encouraged to participate.